Instant messaging services are usually bundled with video and voice chat. They are also usually client software that you have to install on you machine and run separately. So it must have been odd when Google integrated their Google Talk instant messaging service into their browser based email client Gmail. Sure Google Talk also has a desktop client but with other IM clients already established, it failed to catch on out of the browser. Moreover, as a browser based service limited to just keyboard chat, it’s not as powerful as its desktop based rivals. That’s all changed. 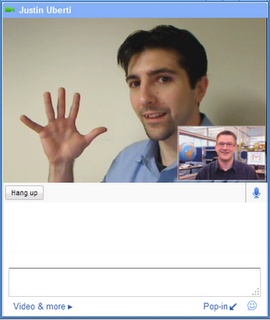 Google is introducing a new feature that leverages the popularity of Gmail to boost the browser based Google Talk. The new feature is voice and video chat. These two now make Gmail into a seamless instant messaging platform. Being a browser based instant messenger usually is a disadvantage for the lack of video and voice chat, but with Gmail’s new capability, there’s a very good chance that desktop based IM services will become an alternative. The integration of Gmail and Google Talk into a single interface bundled with voice and video makes Gmail the most complete communicator. However, as all new Google features go, it may take a day or two before the voice and video features pop out in your account.